As I mentioned earlier in the week, so many brave Canadians have sacrificed everything to preserve our freedoms. If you stop and think about what we asked (and ask) these young soldiers to do, it blows your mind. Back in 2003 I took a closer look at the participation and casualties. So many lost their child, brother, husband or friend. So many lost their lives. My favourite Canadian military accomplishment took place on Easter Monday, April 9, 1917. A couple of years ago, I revisited Vimy Ridge in some detail. It was one of the key massive offensives launched by the Allies in WWI and our forces played a very significant role. 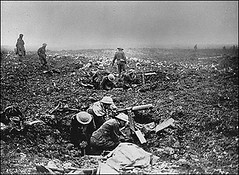 When we captured Vimy Ridge, it was the moment that solidified a very young country. 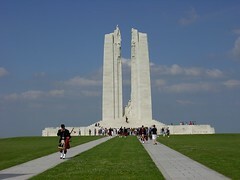 Here's a picture from the battle and the Canadian National Vimy Memorial. Many Canadians paid the ultimate price in war. It's our job to never forget. We have to want remember.